Assorted colors. Includes tennis ball. Pets will have hours of fun playing and exercising with this Knotted Rope Dog Toy that can be pulled, tugged and fetched. Toy is made of sturdy cotton rope, has a knotted handle and a ball end. Measures approximately 18 long. Comes packaged with a hang tag. Ideal for tugging or fetching, this unique dog toy is a fun addition for your pets collection. Rope is twisted with a knotted handle and a small plastic ball attached at the end. Measures approximately 20 long. Comes packaged with a hang tag. Dogs love balls and they love ropes. Both are combined in this fun toy. Throw it and watch the dog enjoy chewing it. This durable toy will be able to handle just about any abuse your dog heaps out and its a toy hell go to again and again for chewing fun. Each ball measures 2 1/2 in diameter. Comes packaged with a hang tag in a poly bag. Dogs love to chew on rope and they love bones. Both are combined in this fun toy featuring a cotton rope knotted at both ends. Colorful design features a myriad of braided colors. Measures approximately 8.6 long. Comes in assorted colors. Comes loose with a hang tag. Great for strengthening dogs teeth and gums, this Multi-Color Knotted Rope Dog Toy provides hours of fun. Each rope is tightly wound and knotted with sturdy cotton rope for durability. Each toy measures approximately 9 long. Comes in assorted colors. Comes packaged with a wrap around. Knotted on both ends and in the middle, this rope is super sturdy and provides tons of fun for pets. It can be pulled and chewed. Rope is twisted in blue, green and brown cotton. Measures approximately 16 long. Comes packaged with a hang tag. Keep your cat busy for hours with this 2-piece Cat Play Balls with Bells Set featuring 2 large plastic two-toned play balls containing a smaller ball and bell inside each one. Large ball has a diameter of approximately 2 1/2 and the smaller ball has a diameter of approximately 1 5/8. Comes packaged in a poly bag with a header card. Provide hours of fun for your cat with this laser light key chain! Point the bright laser at the floor or wall and watch your cat try to catch his or her elusive prey. Key chain comes with 5 interchangeable heads and 3 button batteries. Comes packaged in a blister pack. Cats will go crazy for this Toy Mouse with Bell and Feathers. It has all the things they love. Plush mouse has a furry body and a crinkle tail with a bell and feathers on the end. Measures approximately 10 x 3 x 2. Comes packaged to a hanging panel. Assorted colors. Includes hook inside of carrier, outside velcro pocket, extra long carrying straps and head opening at either end. Larger carrier measures 18"x10"x9". Smaller carrier measures 16"x8"x7". Keep your cat entertained for hours on end with this cat teaser wand. Each wand has a faux feather boa that your cat simply cannot resist. Youll be equally entertained as you watch your pet leap and jump. Comes in assorted colors. Comes packaged on a tie card. Guaranteed to provide your pet with hours of fun, this Sports Inspired Dog Toy features a bone-shaped toy with a sports ball print. Each toy is made of durable nylon with a squeak noisemaker inside. Assortment includes volleyball and football. Measures approximately 10.5 x 4.25. Each toy is packaged with a hang tag. Ideal for playing fetch and a great way to keep your pet active, this Dog Toy with Handle also makes a great training tool. Dog toys are made of nylon and come in assorted colors such as orange or blue. Comes packaged with a hang tag. 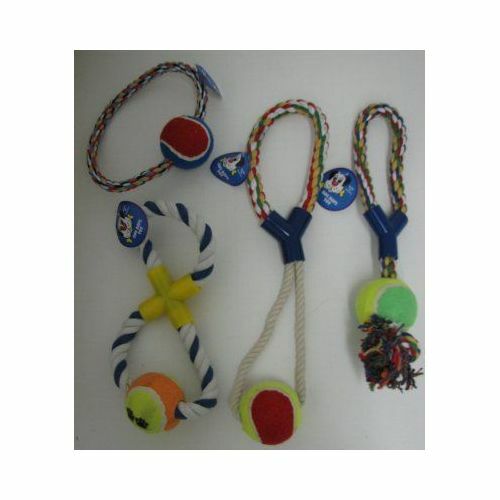 pet rope chew toys .Assorted styles and colors. Gain more control over your dogs walking direction and attention with this Adjustable Dog Harness featuring a sturdy nylon harness that is adjustable in two areas. The dog harness tightens slightly across chest and shoulders which helps prevent pets from pulling on leash. Snap closures and adjustable buckles are made with durable black plastic and includes a metal D-ring for leash attachment. Comes in assorted colors. Comes packaged with a hang tag.